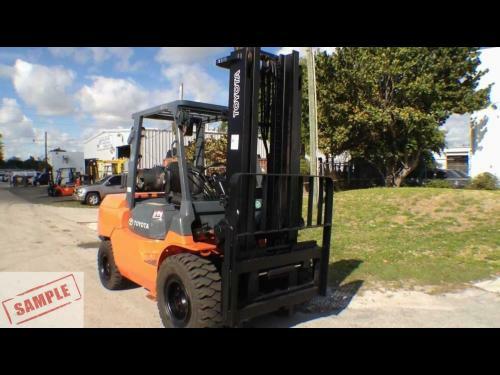 Description: Used Komatsu Forklift, 3500 Lb capacity with 3 stage mast and side shifter. 42" forks, BU alarm and strobe. Fully serviced and reconditioned with new tires, paint, OEM and OSHA decals. 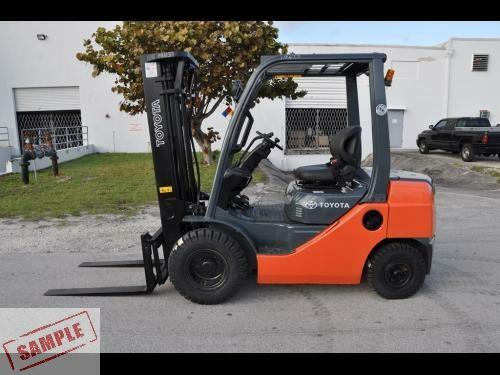 Description: 10,000 Lb Toyota pneumatic with 2 stage mast and side shifter. 54" Forks, BU alarm, and, strobe. Fully serviced and reconditioned with new tires, paint OEM and OSHA decals. 48 Month Wells Fargo lease available to a qualified buyer. New arrival. Sample photo. 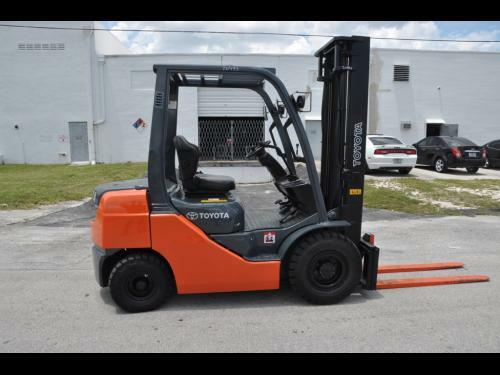 Description: 8 series, 5,000Lb Toyota Diesel pneumatic with a 2 stage 93/147 wide view mast and side shifter. BU Alarm, strobe, 42" forks. Fully serviced and reconditioned with new tires, paint, OEM an OSHA decals. 48 and 60 month lease available to a qualified buyer. New arrival. Sample photo. Description: 8 series, 5,000Lb Toyota Diesel pneumatic with a 2 stage 93/147 wide view mast and side shifter. BU Alarm, strobe, 42" forks. 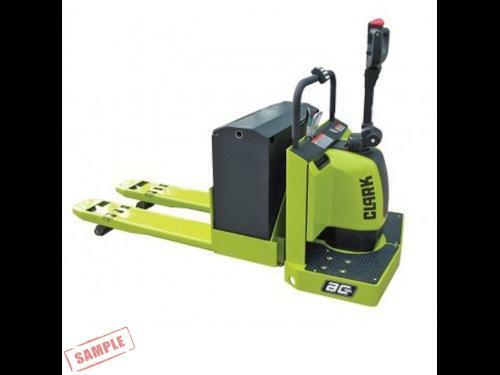 Fully serviced and reconditioned with new tires, paint, OEM an OSHA decals. 48 and 60 month lease available to a qualified buyer. Description: Used Sellick STM55 Piggyback sod loader. 120" 2 stage mast. 42" forks, side shift, BU alarm and strobe. Double reach. Like new. All have less than 700 hours. 3 available. Contact Charles Williams at 817-267-4477 for more information and details. 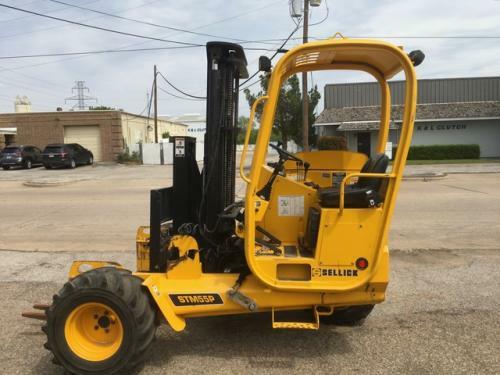 Description: Used Sellick STM55 Piggyback sod loader. 120" 2 stage mast. Doubkle Reach. 42" forks, side shift, BU alarm and strobe. Like new. Aall have less than 700 Hours. 3 available. Contact Charles Williams at 817-267-4477 for more information and details. Description: Used Sellick STM55 Piggyback sod loader. 120" 2 stage mast. Double Reach. 42" forks, side shift, BU alarm and strobe. 3 available. Like new. All have less than 700 hours. Contact Charles Williams at 817-267-4477 for more information and details. 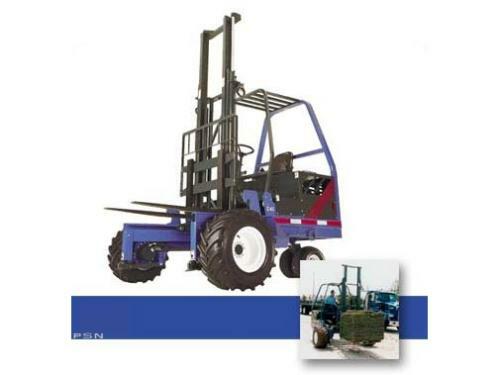 Description: Reconditioned Princeton 4500 Lb capacity sod loader/piggyback forklift. 10' mast, 42" forks, diesel, BU alarm and strobe. Fully serviced. Contact Charles Williams in Dallas at 817-267-4477 for more details and pricing information. New arrival, sample photo. 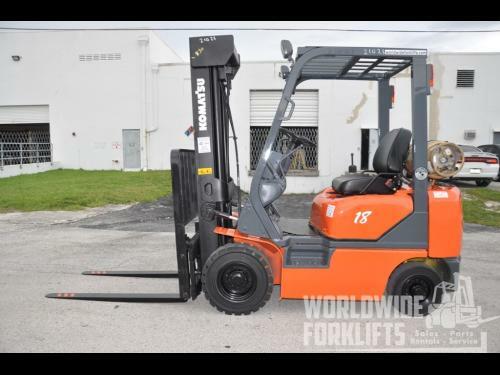 Description: 3000Lb Toyota electric 3 wheel sit down warehouse forklift with 3 stage mast and side shifter. 42" forks, BU alarm and strobe. New battery, used charger. Fully serviced and reconditioned with new tires, paint, OEM and OSHA decals.